Fortnite was one of the most played games of 2018, with millions of players worldwide having fun with Epic’s online multiplayer game. The game’s weekly challenges also kept many people on their toes last year, and now that 2019 has kicked in, Epic has released a fresh batch of free challenges for Fortnite. The challenges corresponding to season 7, week 5 are the following: Land at Polar Peak, Deal damage to opponents’ structures and get 3 Suppressed Weapon eliminations. The first challenge actually has 5 stages. 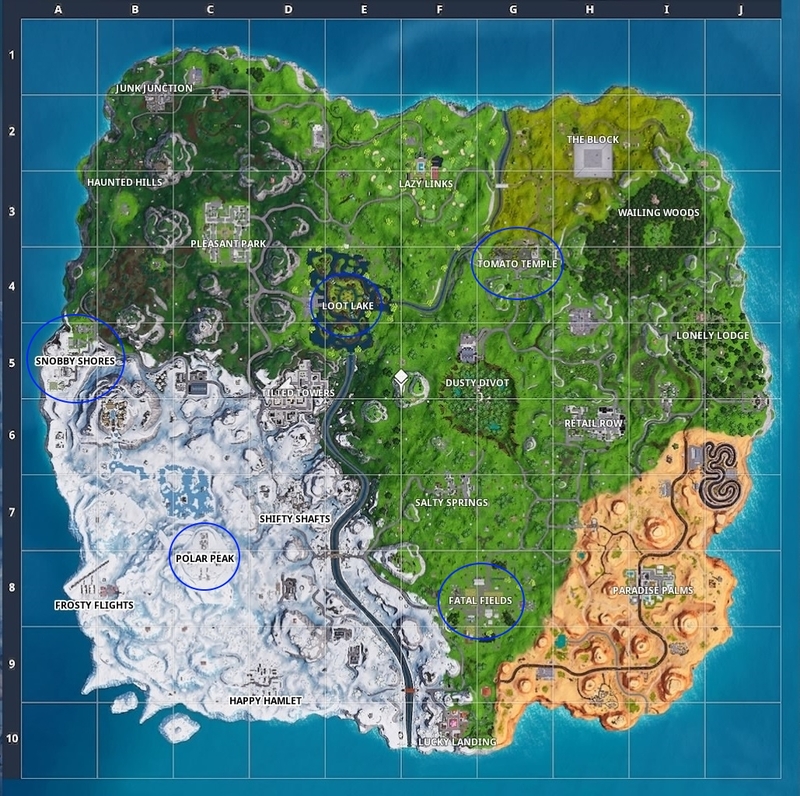 After landing at Polar Peak, you’ll after be required to land at Fatal Fields, then at Tomato Temple, after this at Leaky Lake, and finally at Snobby Shores. You have to do this in different matches, after you’ve been eliminated in the game (or won the Battle Royale if you’re a top-level player). Note that all these locations are easy enough to find on Fortnite’s map: it’s just a matter of exiting the bus as close as possible to any of these locations in order to land on them by skydiving or gliding down gently, thereby completing the corresponding stage of the challenge. 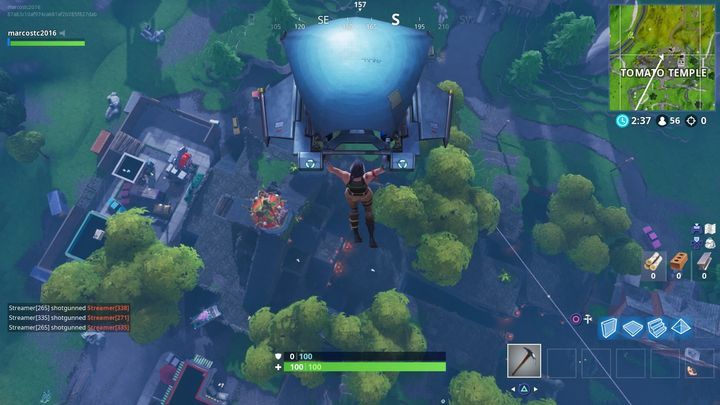 Regarding the landing at Leaky Lake stage though, the location you’ve actually got to land in is called “Loot Lake”, which I’ve marked for you on the map below, as well as the other locations you have to land at in order to ace this challenge. Dealing damage to opponents’ structures (this week’s second challenge) is not so hard to complete either. You’ve just got to demolish any junk other players have been building during the match with your pickaxe or other weapons. You need to destroy enough structures (platforms, stairs, walls and so on) to score 5,000 points, something which is even possible to do over the course of one match. Suppressed weapons eliminations (you’ve got to score 3) are this week’s hardest challenge, mainly due to the fact that you’ve got to locate a suppressed weapon first, and also what a cutthroat game Fortnite Battle Royale is, making it hard to eliminate players sometimes. 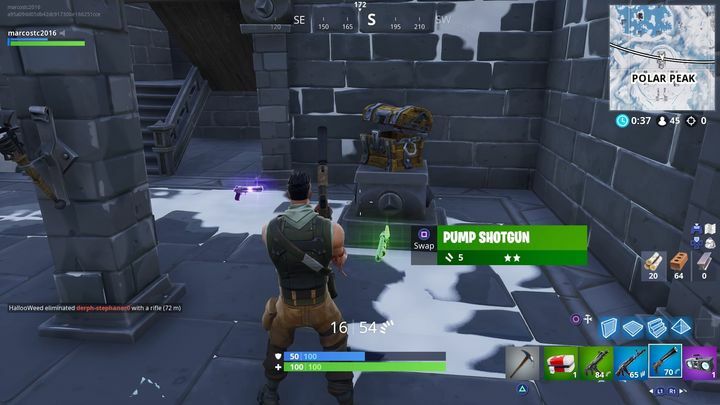 You can find a suppressed pistol or automatic rifle in one of the chests scattered throughout the game’s world, but the screenshot below shows where I found a suppressed pistol in one of my last matches. This location is on Polar Peak (one of the landing challenges). The chest in question is located on the bottom floor of one of the stone buildings situated on the peak. Note that suppressed weapons might still spawn randomly in chests throughout Fortnite’s map, though. Next: Is the Elder Scrolls 6 coming in 2019?